The Trollfjord is one of three Millennium ships that Hurtigruten (then Norwegian Coastal Voyage) introduced in 2002 and 2003. A beautifully appointed small ship, the Trollfjord has a winter theme with a modern design, featuring Norwegian wood and stone throughout the interior. Large windows were installed throughout the ship to let the light and scenery into the public areas, and even the elevators are made of glass. There are few places on Trollfjord without a view of the beautiful Norwegian coast where the ship sails. The works of Norwegian artists decorate the ship’s interior. The sauna and fitness area, as well as the small swimming pool and Jacuzzi, are located on the top deck, where passengers can enjoy the spectacular views, including the Northern Lights during the winter, from the large outdoor area. 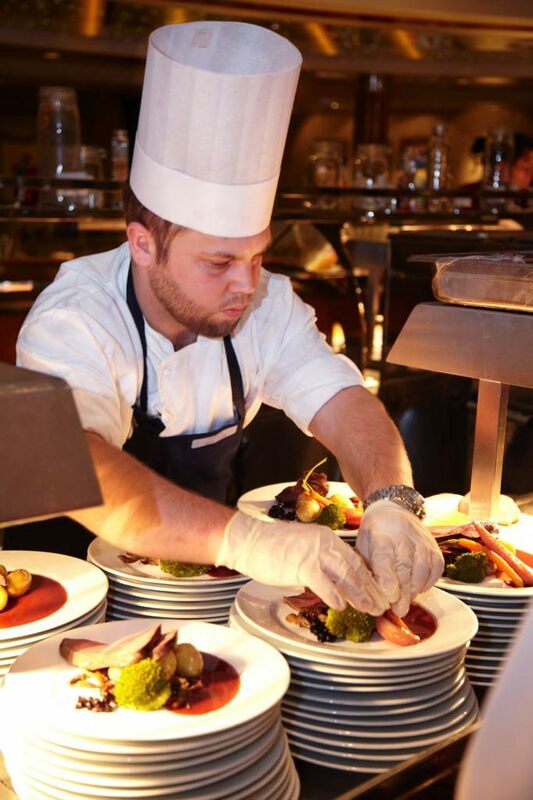 Several restaurants, bars, and indoor and outdoor cafés are available throughout the ship. The main dining room, Saga Hall Restaurant, hosts three meals daily. Breakfast and lunch, which features the famous Norwegian “cold table,” are self-serve, but the three-course dinner is served in two seatings. Other dining and bar venues: Saga Snack Bar (open 24/7), Café Viking Safari, Café Viking Saga, Viking Market Shops, Polar Bar, Cognac Lounge and Fjord Bar. The two-story panoramic lounge provides spectacular views of the coastal scenery. Eleven grades of cabin are available on Trollfjord. Double beds are available in only in the 23 suites (five with balconies), and all the other cabins have fixed beds and berths. Some cabins also have a third upper berth. A number of cabins are available for single occupancy — single travelers pay a supplemental upcharge. Only 89 cabins are inside, and the remainder, 188, are oceanview (no balconies). The 220-volt outlets require adapters for U.S. appliances. 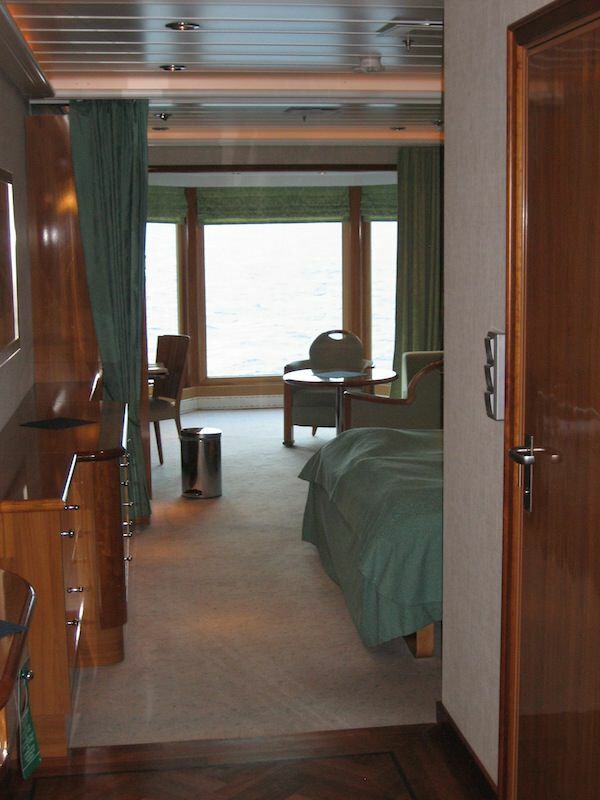 Staterooms and suites range from 86 square feet to 484 square feet. I cruised Trollfjord in February 2013. I found her to be comfortable and well-suited for appreciating the beautiful coast of Norway. The vessel features plenty of windowed lounges to enjoy the views. 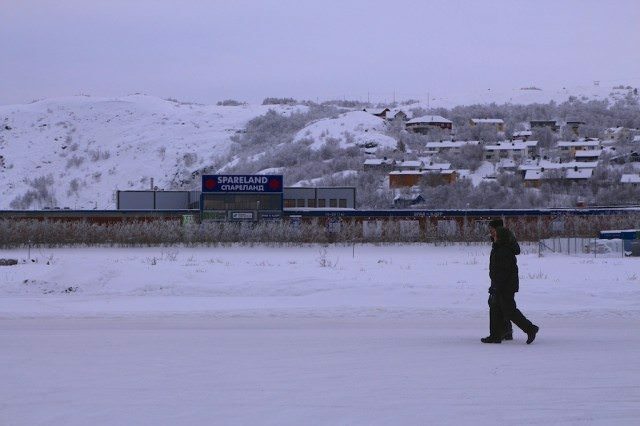 As I write this, passengers are sitting inside the lounges, reading books and looking up occasionally to view the wintry landscape. I am using the free wireless internet in the lounge to post this story (for those who travel without a wireless device, several computer terminals are available for use free of charge on Deck 8). Others are walking around the promenade on Deck 6 (four times around, and you can click off a kilometer), some are in the sauna, some are in the Jacuzzi and some are using the fitness area. Trollfjord has most of the features and facilities of the ocean-liners. 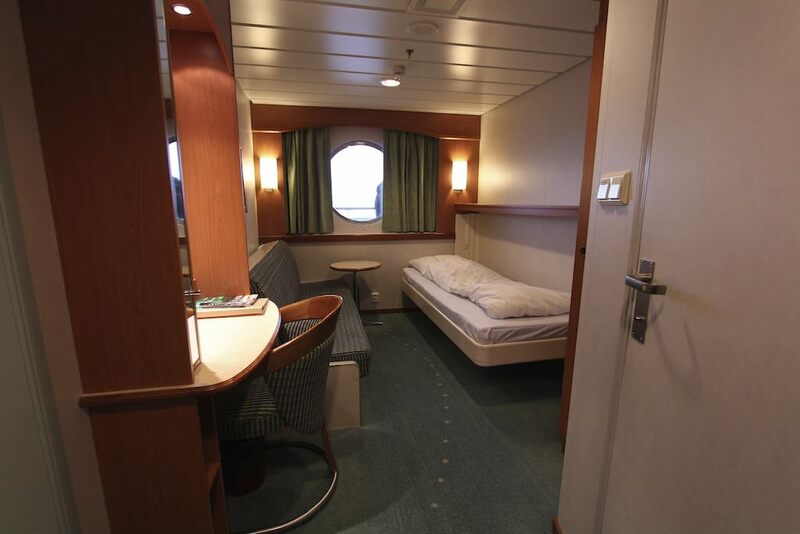 Staterooms are basic, but comfortable. Mine, room 652, featured two fold-down single beds, a desk, two closets, bath with shower and an oversize porthole that allowed me to gaze out on the stunning scenery (and conversely allowed those walking the wrap-around promenade deck to gaze in had they wished – it did not happen, however, and I could have simply closed the curtains for privacy). 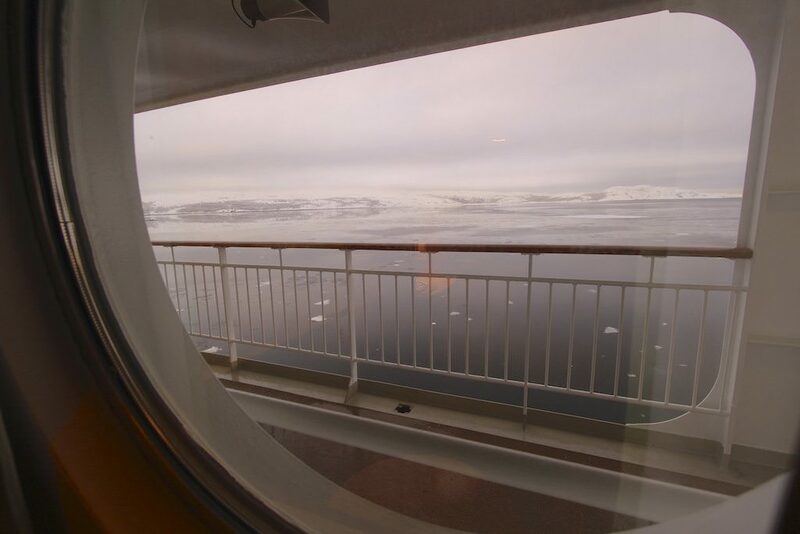 The Norwegian landscape is so majestic that you’ll find yourself spending little time in your stateroom. Plus, with Trollfjord visiting 34 ports in six days during my voyage, passengers also spent plenty of time ashore. Meals are included on Trollfjord for those who buy the cruise package (don’t worry, if you’re booking the full journey, starting at around $1,000 per person, you’re likely booking the cruise package). Hurtigruten, and its fleetmates, operate dually as cruise ships and coastal ferries, so you will find that some passengers are on board simply to get from one town to another. Some are even traveling with their cars, which can be transported by the vessels. You may see them paying for their meals with cash or credit cards, something you’d rarely, if ever, find on other cruise ships, except in speciality restaurants. Heavy imbibers will want to note that alcohol in Norway is excruciatingly expensive. A beer, for example, will cost you nearly US$12. If you’re caffeine addicted, you will want to know that coffee’s not cheap either. 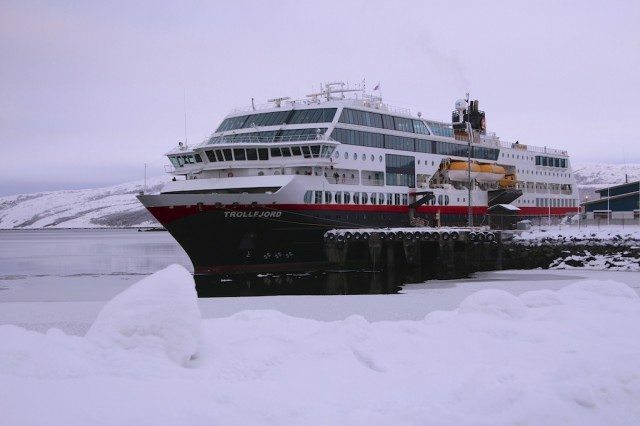 Hurtigruten offers a special coffee package for NOK295 (about US$53) that includes a souvenir mug and as much drip coffee or tea as you can consume. Specialty coffees are not included but available for an extra charge. However, don’t let that sway you to believe that you’ll spend a fortune in Norway. 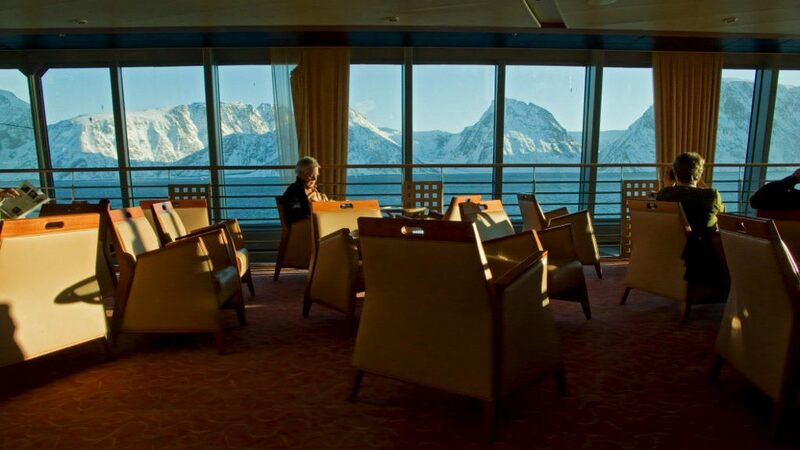 If you stick with Hurtigruten’s program, dining in the main dining room and saving your wine consumption for another cruise, or, say, the south of France, you’ll do fine. Excursions are priced comparatively to those on ocean cruisers. And something you won’t get on those big ships: free, and functional, internet. 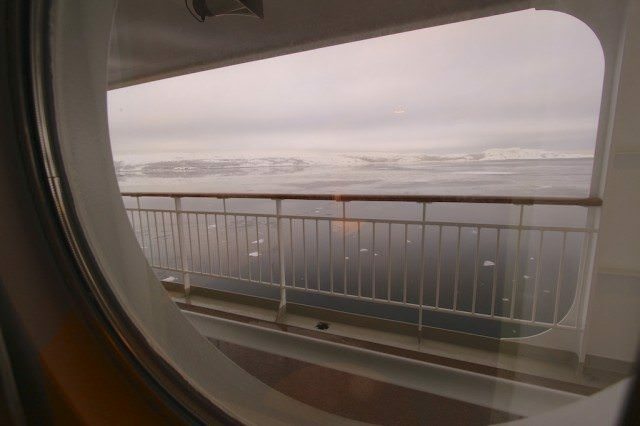 The Avid Cruiser’s Take On Hurtigruten’s Norwegian Winter Voyages: Highly Recommended for those who can appreciate the winter, the natural phenomena of the Northern Lights and the gorgeous Norwegian landscapes. 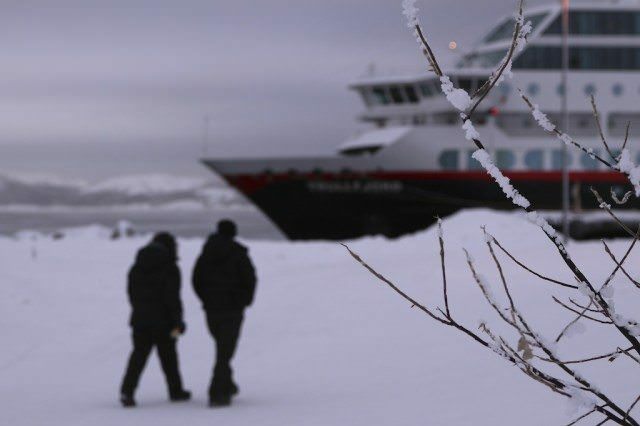 If this sounds like you, a winter cruise in Norway is definitely something that you will want to add to your bucket list.